It was a fabulous weekend on the 8th and 9th June as two great events took place in and around Lincoln for charity. 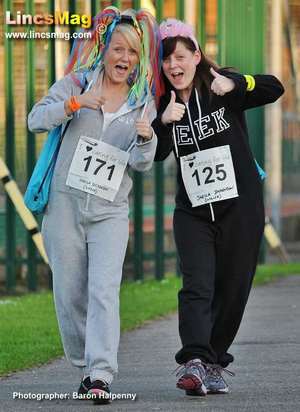 Saturday night saw the eighth annual Moonlight Walk to help raise much needed funds for the St Barnabas Lincolnshire Hospice that was this year a 'one night in a onesie' themed event. Extra special was that a new World Record was set at the Yarborough Leisure Centre in Lincoln for the largest gathering of people wearing flashing headgear, which made for a wonderful and entertaining sight as well as setting off the mood for a fun night to raise money. “St Barnabas provides specialist palliative and end of life care so that everyone can access and receive the support they need to live well and ease the process of dying. To see more pictures from the "One Night in a Onesie" Moonlight Sleepwalk 2014, visit the Album on our Facebook page HERE! Sunday saw thousands of ladies and young children run, walk and dance their way around the popular Lincolnshire Showground for the Lincoln Cancer Research UK’s Race for Life. The event was to raise money to help fight cancer by encouraging women of all ages, shapes and sizes to run or walk a 5k or 10k route. The money raised is intended to go towards Cancer Research UK’s doctors, nurses and scientists to advance research in order to save lives of men, women and children. Many did the Lincoln Cancer Research UK’s Race for Life for everyone who has and is suffering from cancer but others had their own poignant stories to tell. 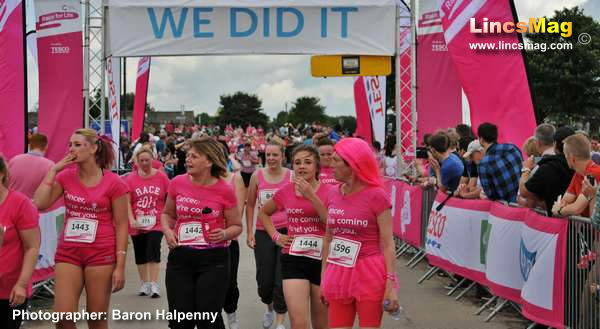 To see more pictures from the Lincoln Cancer Research UK's Race for Life 2014, visit the Album on our Facebook page HERE!